Volunteers Needed: The parade is even better as a participant! March with us in the parade, hand out seed packets to spectators, enjoy the spirit of a Forest Park St. Patty's day! Email: carpediem80 (at) gmail (dot) com. Look for us at the Forest Park St. Patrick's Day Parade on Saturday, March 5 at 1pm. How will you spot us? Well, we are kind of hard to miss. Wouldn't you agree? Every year we deck out a truck and create a mobile garden to introduce our community garden to residents and friends of Forest Park. In addition to marching in the parade we give out hundreds of seed packets along the parade route to gardeners and potential gardeners to plant in their own yards. This year we are hoping you will share your experience with growing our free garden seeds by using the #ForestParkGrows hashtag on social media sites like Twitter, Instagram and Facebook. Make plans to join us at our 6th Annual Seed Swap on Sunday March 13 from 2-4pm at St. John's Church. We'll post an update leading up to the seed swap with instructions on how to participate. 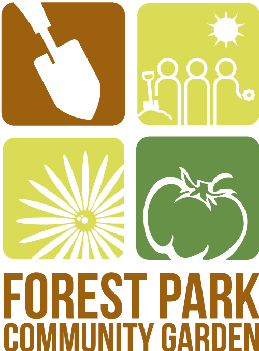 You do not need to be a member of the community garden or even a resident of Forest Park to participate in the seed swap.